Jack Gage of JRG Refrigeration manages a new ice cream production factory and cold storage warehouse for Casper’s Ice Cream in Richmond, Utah. In order to maintain its quality, ice cream requires storage at a temperature of -20˚F. This application also requires a consistent liquid feed into vessels that meter the flow from high to low pressure and keep the pressure steady. If the valve opens too quickly, it's difficult to regulate the flow of liquid and maintain steady pressure. To ensure consistency, Jack needed a solution that enables the level in a given vessel to be customized and maintained with precision. 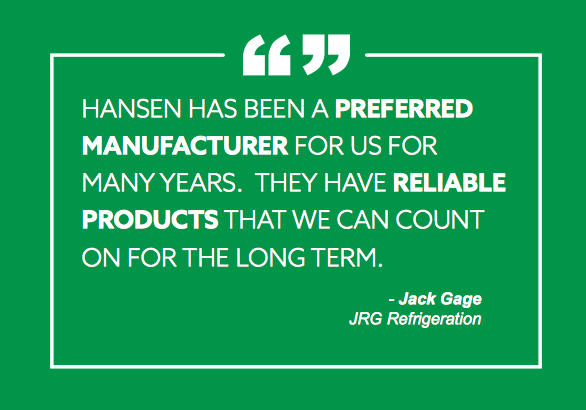 Jack contacted Hansen regarding the newly designed Hansen Motorized Control Valve (MCV) and selected a pair of Hansen’s MCVs for the ice cream factory and warehouse. The Hansen MCV Motorized Control Valves are perfect for this type of application because of their ability to modulate flow. Combined with the right controls, motorized valves can match their feed rate to the consumption rate of the system providing a constant and even feed rate to the vessels. Having a steady feed rate helps the overall suction pressure stability which has a positive effect on the stability of the delivered product and system efficiency. The MCV valves provide the level control Jack needed. To verify his findings, he pulled data from the control system and compared performance before and after the new MCV installations. The old system had an average swing in the vessel levels of 3-3.5%. On the new valves Jack saw an average swing of 2-2.5% in the vessel levels. Two Hansen Motorized Control valves having reduced capacity V-ports (Type MCR). 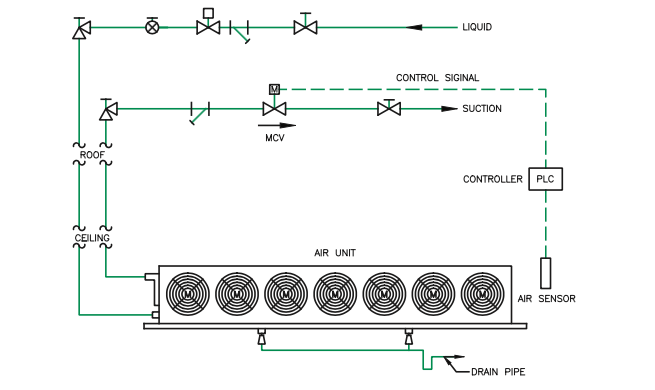 Liquid make-up arrangement from the high pressure receiver-to-intercooler vessel and intercooler vessel-to-pump recirculator vessel. Both valves have special reduced capacity V-ports. A consistent liquid feed is required into vessels to keep pressure steady. If the valve opens too quickly, it’s difficult to regulate the flow of the liquid. 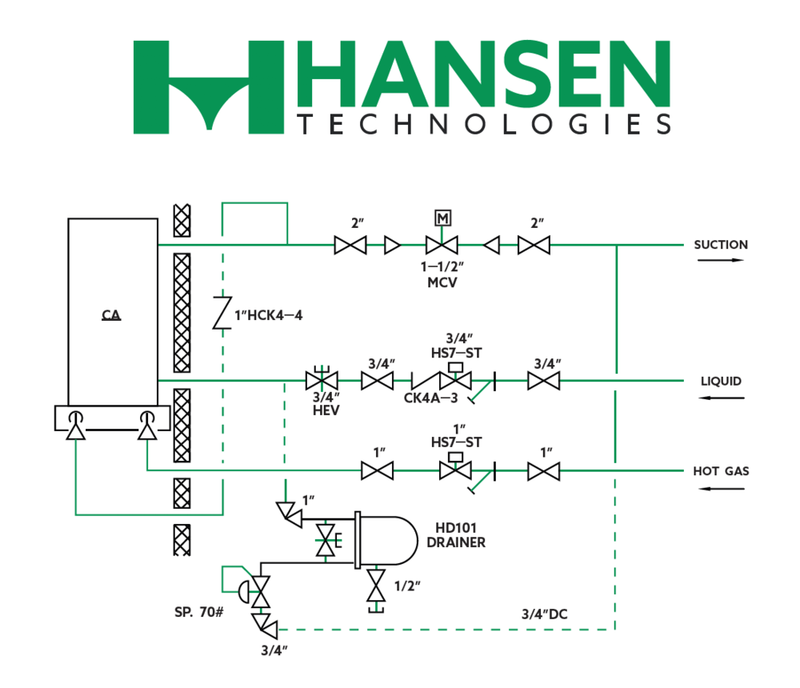 The Hansen MCV Motorized Control Valves with reduced V-port allows gradual and controlled liquid feed metering resulting in more steady liquid feeds with lower swing levels. • Additional benefit: Integrated display that’s easy to use and see. Converting the existing valves to the new MCV which virtually eliminates the potential for moisture build-up and results in much more reliable and precise operation overall. Improvements were noted in these key areas: Motor actuator housing, function, forward-facing digital readout, and an improved power cable with stronger connections. The molding appeared more secure, as well, and the housing seal now eliminates moisture inside which, in the past, contributed to shorting. Together these factors provide more reliable functionality all around. An additional benefit Joe noted in the new construction is that the indicator light is helpful in letting you know when you’re in the program settings. 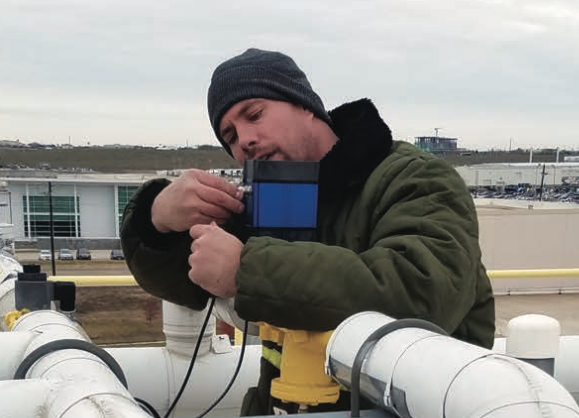 Case Stories: Lake Ontario Fruit Co.
John Gay, Lake Ontario Fruit Co.’s plant engineer, needed a way to make sure the company’s inventory was protected during ripening intervals and through the critical harvest period. His main goal was to eliminate any mechanical problems and improve temperature control. Apples require absolute reliability. Any variation or refrigeration failure can wipe out the work of an entire season. The net worth of just one 60 x 60 foot (18 x 18 meters) storage room at Lake Ontario Fruit Co. is typically $300 to $500 thousand. The company installed the Hansen MCV on the advice of its contractor in three of its ripening rooms. Temperature and atmosphere control make up the foundation of an apple storage and processing facility. Refrigeration is the essential first part of that equation, working to regulate ripening and minimize it as much as possible. At Lake Ontario Fruit Co. – where the ripening needs of most apple varieties demand that temperature vary only a tenth of a degree Fahrenheit (0.05C) – specificity and reliability are the most important factors. Rugged performance is important in any harvest operation. A mid-season valve failure is an unacceptable infrastructure problem, so the factors that could cause such a failure must be non-issues. The company chose the Hansen MCV on its reputation for rugged reliability and its ability to perform to extreme temperatures. New advances in automation now allow fine temperature and pressure control. With Hansen’s MCV, Lake Ontario Fruit Co. could make smaller, automated adjustments resulting in a 50% improvement in temperature control range. 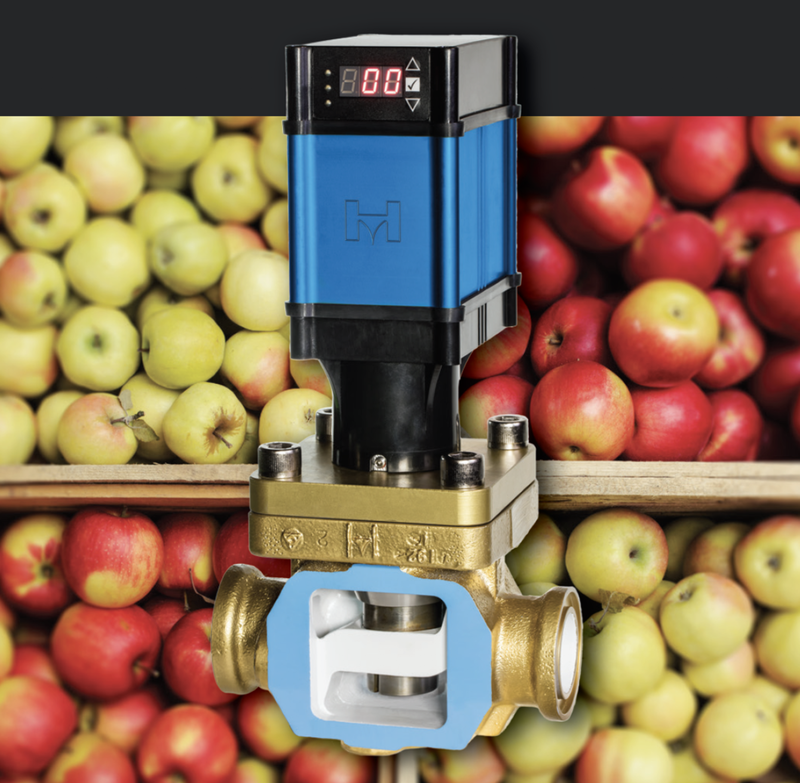 The new valve design also moved Ontario Fruit to the next level in advanced control and communication between the valve and automated control system. John Gay – Lake Ontario Fruit Co.